I am a total sucker for a delicious chicken tender or nugget, fried to a perfect crispy crust and juicy inside, so The Nugget Spot is the perfect place to satisfy my nugget fix. There are some non-nugget items on the menu, but obviously the main focus is on their nuggets. If you're not a fan of chicken, don't worry, they've got you covered. The Nugget Spot also has fish, polenta, mozzarella and veggie options. In the name of research and to bring you the best review possible (such sacrifices I make for you, huh?) I did a double order of nuggets! My lunch included a 5-piece order of "Wake & Bacon" chicken nuggets and a 5-piece of fish nuggets. I rounded the lunch off with a side of coleslaw and an orange soda. I love bacon. I mean, seriously, I LOVE bacon. When I saw the menu had a nugget that was breaded in crumbled bacon breading, it was an absolute no-brainer that this was going in my order. Plus it's served with a maple syrup dipping sauce...DUH! I will be adding a few additional workouts to the tally of workouts that I am waaaaay overdue. The chicken nuggets were great. The nugget itself is a nice sized bite that remained very juicy. These are real chunks of white chicken meat, none of that pink slime you get at McDonald's (although, full disclosure, I have a secret place in my heart for those terrible McDonald's nuggets too). The breading was nice and crispy and not overpowering. I did get a hit of the bacon flavor, but it wasn't as prominent as I would have hoped for considering bacon was in the title of the dish. That said, it was good, and you do get the influence of the bacon. The dipping sauce is pretty much just maple syrup and that simplicity is perfect for these nuggets. The sweetness balances the salty juicy flavor of the chicken and bacon. Next we go to the fish nuggets. Honestly, the fish was pretty average. It wasn't bad, but it wasn't a standout. I think if you're going to look for fried fish, then you should go somewhere that does it right. The breading was nice and crunchy. The fish inside was a little wet (I'm guessing this was frozen fish) but it wasn't bad. The dipping sauce had a nice little bit of spice to it, but I would skip the fish overall in favor of other nuggets here. Combos at The Nugget Spot come with a side and I went with coleslaw. 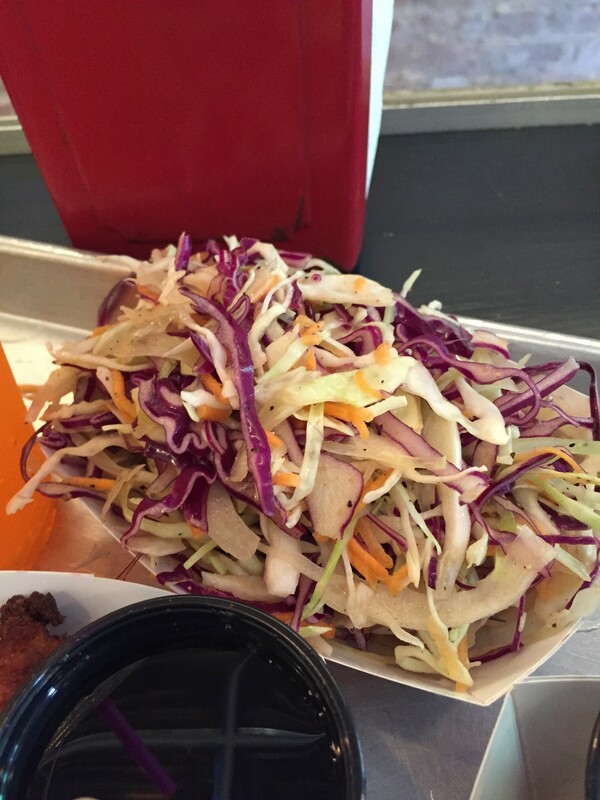 Bad/average coleslaw can be pretty disappointing, but when I find a great one, it can be a real revelation. This coleslaw surprised me in a couple of ways. First, it was delicious and I wasn't really expecting a place like this to have a great coleslaw. I would have figured it would have been more of an afterthought and fall in the "average" camp. Secondly, while it looked more like a creamy slaw (my preference) it was actually more of a crunchy vinegar based type. It had more sweetness than you usually get from a vinegar slaw but maintained the nice bite of vinegar. It really paired nicely with the sweet and salty of the bacon and maple in the nuggets. There is a whole menu of dipping sauces and variations on nuggets to choose from, so you can mix and match to suit your tastes. A 5-piece combo with side and drink runs around $10 and is a good portion size for a lunch stop. The restaurant is counter service with a pretty good amount of seating. Nuggets are cooked fresh to order, so it's not fast food, you'll wait 6-8 minutes for your order, but if you want an upgrade from the formed nuggets of McDonald's, this place hits the spot.